There are times when a 360° impact indexed coverage of a vessel is not desired and more targeted cleaning is needed, such as when cleaning a spray drying column, smokestack, ribbon blender or cleaning machine oil from the outside of tanks during the manufacturing process. This is when the choice of a Butterworth Unidirectional machine should be made. 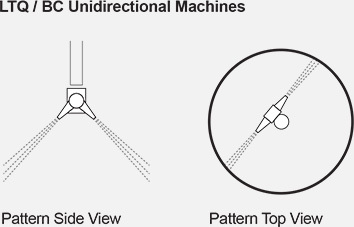 The nozzle bodies on Butterworth Unidirectional Machines are pinned such that they do not rotate. 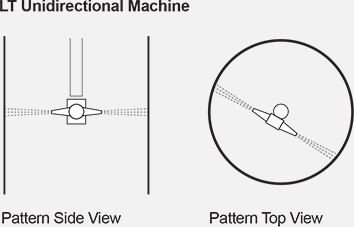 For the LT Machine, this means that while the body of the machine still rotates about the inlet or x-axis. The nozzles will then be pinned at 9 and 3 o’clock. This allows the machine to be used in an open tube, such as a spray dryer or smokestack, to target clean only the walls of the vessel. For this operation, the machine would be lowered on a hose to the bottom, then slowly raised as the unit rotates, cleaning the entire length of the vessel. For the LTQ and BC Machines, we have options, depending on the operation. The typical configuration is to pin two nozzles at the 4:30 and 7:30 positions, however, these could be pinned in any configuration to meet the customer requirements. Three and four nozzle configurations are also available. Typically, these machines would be used in ribbon blenders and for cleaning steel tanks during the manufacturing process.